Darwin’s Ground Sloth (Mylodon darwini) is one of the earliest ground sloths to be described and is the namesake for the family Mylodontidae. This species lived in South America during the Pleistocene and is exceptionally well known thanks to the preservation of subfossil bones and soft tissue from cave sites. Restored skull and head of Darwin's Ground Sloth (Mylodon darwini). Reconstruction based on skull and mandible MACNC Pv 2334. 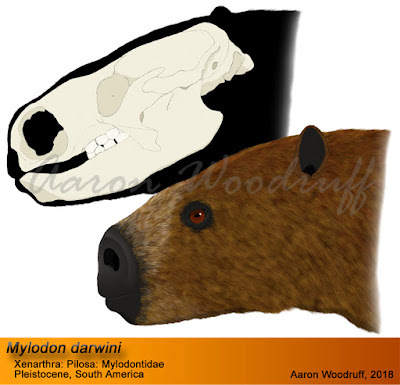 Mylodon was one of the earliest ground sloth genera to be erected; after Megatherium (1796) and Megalonyx (1825). The genus name is a combination of the Greek words mylo and odous, meaning “molar” and “tooth” respectively. The species name honors the English scientist and naturalist Charles Darwin, who discovered the first known fossil of the animal during his survey expedition on the HMS Beagle. This specimen, a nearly complete lower jaw with teeth, was then given to Richard Owen who formally described it in 1839. The full scientific name translates literally as “Darwin’s Molar Tooth”, a possible reference to the animal’s homodont molariform teeth. For the purposes of this blog, I will be referring to this species as “Darwin’s Ground Sloth” or “Darwin’s Sloth”. in Owen, 1839b. Scale bar = 10cm. Figure 5a from Fernicola et al., 2009. Darwin’s Sloth fossils are known from late Pleistocene (Lujanian) sites throughout the South American countries of Argentina, Bolivia, and Chile. Claims have been made for this species' survival well into the middle Holocene, but these are unproven. All evidence suggests that it had a broad environmental tolerance; it was capable of inhabiting arid to semiarid savannas, warm and humid forests, and even cold montane environments. This species is known to have utilized caves within its home range. Darwin’s Sloth was a relatively large animal with a maximum estimated body mass of 1,000kg (2,200lbs). Complete skulls ranging in length from 59 to 71cm (2 to 2.3ft) in length are known. Based on this, a combined head-and-body length of 265 to 320cm (8.6 to 10.6ft) may be estimated assuming that its proportions were similar to those of the closely related Harlan’s Ground Sloth (Paramylodon harlani), which is known from multiple complete skeletons. 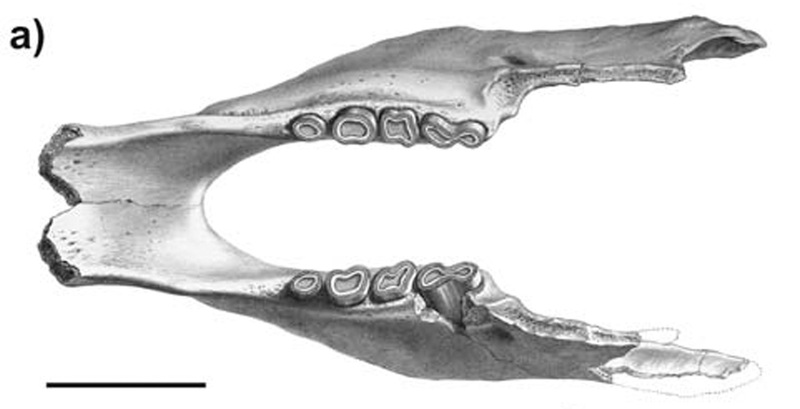 Like other browsing ground sloths, Darwin’s Sloth had a relatively narrow skull with a sturdy snout. In fact, the species’ skull is characterized by a bony arch formed by ossified nasal cartilage. Analysis of the hand suggests that the fossorial (digging) capabilities of Darwin’s Sloth were moderate when compared to other mylodontid sloths and the animal may have renovated abandoned burrows from other animals rather than excavate its own. Although abundant postcranial material is known, a complete skeleton has never been mounted and all reconstructions of this animal are speculative and often based on a closely related species or even a combination of several species. Articulated skull and mandible of specimen MACNC Pv 2334 in lateral view. Note the distinctive bony nasal arch. Figure 2 from Brandoni et al., 2010. Despite a lack of complete skeletal material, much is known about the life appearance and ecology of Darwin’s Sloth thanks to exceptionally preserved soft tissue remains recovered from dry caves, most notably from Cueva del Milodon (Mylodon Cave) in southern Chile. In addition to bones, a complete pelt, claw sheaths, and dung belonging to this species was recovered from this site. Thanks to these findings, we know that Darwin’s Ground Sloth was covered in thick, reddish-brown fur. 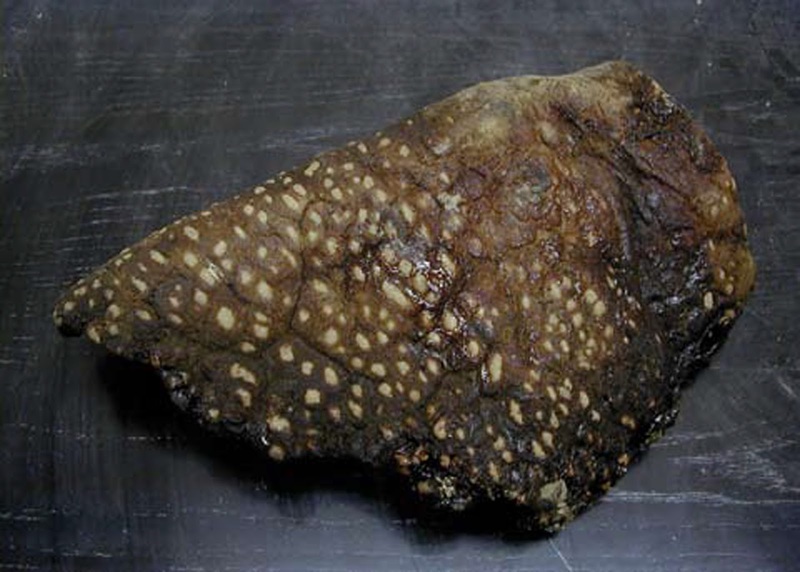 The skin itself was thick with a network of pebble-like osteoderms embedded within it. These remains were so well-preserved, in fact, that they were initially thought to have come from a recently dead animal. This inspired several expeditions into the remote reaches of South America with the hopes of finding a living example of the species. Of course, these expeditions ended in failure and the specimens have since been dated to around 10,000 years ago (click here for a lovely write-up detailing these expeditions). However, the superb condition of this ancient soft tissue speaks to the remarkable preservation potential of cave systems. Natural History Museum, London. Wiki. Darwin’s Sloth has traditionally been considered to be a grazer which lived in open grassland environments. This interpretation was due to the plant remains found within the preserved dung from Cueva del Milodon, which show that the individual that left them fed mostly on grasses and sedges near the time the dung was deposited. While compelling, this finding is not a reliable indicator of the year-round dietary regime for the species. Recent biomechanical and functional morphological studies suggest that Darwin’s Sloth was instead a mixed or selective feeder which could utilize a broad range of plants depending on the time of year and situation. Perhaps, like modern mixed feeders, its diet was more graze-based during wetter periods when the grass is green and growing, and then shifted to be more browse-based during drier periods. The animals which have been found in association with Darwin’s Sloth are indicative of grassland, savanna, or open woodland habitats with ready access to water. These include such animals as gomphotheres (Stegomastodon), deer (Morenelaphus and Antifer), notoungulates (Toxodon), litopterns (Macrauchenia), horses (Hippidion and Equus), other ground sloths (Megatherium), and tapirs (Tapirus). Possible predators of Darwin’s Sloth included Jaguar (Panthera onca) and Southern Sabertooth (Smilodon populator). We know that it interacted with and was probably hunted by humans during the late Pleistocene; the preserved pelt mentioned above shows the telltale signs of having been removed and worked by humans. Whether or not the humans actually killed this sloth is unknown, but the skinning of such an animal was undoubtedly difficult due to the thickness of the skin and the embedded network of osteoderms which must have served a protective function similar to chainmail. This may be the reason the pelt was ultimately left in the cave and not taken by those who processed it. claws, or spears and arrows. Image source. Thanks for reading! If you like what I do here on this blog and want to help me produce more frequent and higher quality content, please consider donating over on my Patreon page. Any amount, even just $1 is a big help and is much appreciated, and in return you get exclusive updates, blog previews and in-progress artwork, and more.